Enjoy gardening with EMSCO Group’s Easy Picker Elevated Grow Box! Made of UV-protected resin, the Easy Picker is designed to support a grow box, plants, and soil. Four easy swivel casters give you complete control over the box’s positioning, letting you take maximum advantage of moisture, temperature, and sunlight. This portable garden bed is ideal for homeowners with limited space that wish to grow plants and vegetables. Owners can take advantage of the Easy Picker’s small footprint and the mobility provided by casters to grow vegetables on their deck, balcony, fire escape, and other small spaces. Additionally, the Easy Picker automatically waters plants by wicking water from its water reservoir. Plants rest above an aeration screen to improve the flow of oxygen to their roots, promoting faster growth. For added convenience, below the grow box is a storage grid for all of your gardening supplies, allowing for easy storage and transport. The product’s resin is a food-safe, high-density polyethylene that is BPA- and phthalate-free, which makes it safe for growing edible vegetables. The Easy Picker has an elevated height of 30” to eliminate the need for kneeling, stooping, or bending, allowing homeowners to enjoy gardening efficiently and without difficulty. It’s also ideal for seniors and wheel chair users. The Easy Picker includes an instruction booklet to get you growing in no time! Start your very own mini greenhouse at home with the EMSCO Easy Picker! CONVENIENT MOBILE PLANTER - The Easy Picker is the ultimate raised bed gardening system. The unit is mobile and features four swivel casters for easy transport and sun tracking that works great in areas with limited space. SELF-WATERING AND IMPROVED AERATION - The self-contained system of the Easy Picker is self-watering. It automatically waters plants by wicking moisture from its 2-gallon water reservoir and has water overflow holes to prevent overwatering. Additionally, plants rest above an aeration screen that enhances the oxygen flow to plant roots and encourages faster growth, which allows you to grow more with less effort. SPACE SAVER - The Easy Picker is perfect for homeowners with limited space who wish to grow plants and vegetables. It is less expensive than large, traditional raised bed gardens and can be used to introduce people to gardening with minimal investment. Even users in tight urban areas can use the Easy Picker, as you can grow vegetables in small spaces, such as fire escapes or rooftop verandas. WEED PREVENTION -The Easy Picker alleviates weed growth by having its own self-contained soil system. A mulch cover is included to further prevent the development of weeds. 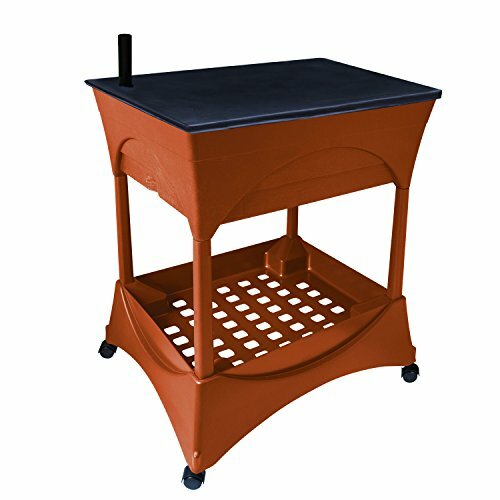 30" STAND - With its convenient elevated height of 30", homeowners can tend to their plants while standing. This eliminates the need for kneeling, stooping, or bending, so you can enjoy gardening without difficulty. This feature is ideal for seniors and wheel chair users.